5 AM … Ring, Ring, Ring …RING, RING, RING!!! …Ugh! Yawn … What the heck? Hello?? Huh? Wait, what? Why? Am I being punked? I shuffle over to the window, the tiniest of flurries are cascading down with a vengeance. Again? Sigh. Fine. Maybe I can still get back to sleep. But such is not MY lot this morning (insert grumbles here), you see, I have three boys ranging from Elementary to High School. Five more robo-calls and four robo-texts later, all spread over a total four different numbers, I am now fully awake and YES, I get it – it’s another Snow Day! Yay? The first image I see this morning is that of Yellow Jambhala, as painted by his Holiness the 17th Gyalwang Karmapa. I can’t help but stop several minutes to savor and enjoy it. Something about it appeals very much to me: Is it the colors? The style? What comes to my mind? Ah! Yes, Yellow Jambala, it’s what he represents that is resonating with me. Jambhala (also known as Dzambhala, Dzambala, Zambala or Jambala) is the God of Wealth and a member of the Jewel Family. He is the protector of all Lineages and of all sentient beings from all sickness and difficulties. There are five different wealth Jambhala, each a different color (white, yellow, black, red & green) – all manifestations of the compassion of Buddha and Bodhisattvas to guide sentient beings along the path to enlightenment. Each has his own practice and mantra to help eliminate poverty and create financial stability. Aside from being different colors, and shown in different poses, they are all portrayed holding a mongoose in the left hand that spits out precious gems for the poor and needy. They ALL have the essence of generosity. White Jambhala is said to be the manifestation of Avalokitesvara Bodhisattva (he who listens to the sounds around him and embodies compassion). He is able to stop suffering and to dispel bad Karma. Chanting his mantra can also bring wealth, avert disaster, and give you good health. He sits on a snow lion. Yellow Jambhala is considered the most popular and powerful of the Wealth Gods. 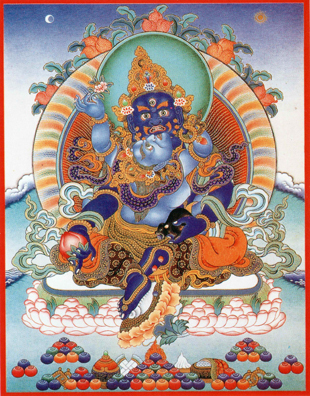 He is thought to be the manifestation of Buddha Ratnasambhava, the Buddha of Giving. It is said you must practice Buddhism using correct procedures to gain the most powerful blessings from him, not just wealth but wisdom and intelligence are his gifts. He is usually shown sitting on a lotus, sun and moon disk. 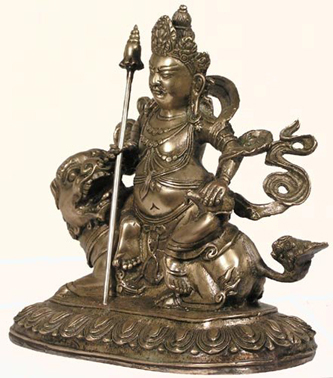 Black Jambhala is also known as the Hindu God of Wealth, Kubera. He will fulfill your wishes, make you happy, and give you wealth and prosperity. He is usually seen standing on a corpse and with a Kapala (a cup made from a human skull) in his right hand. 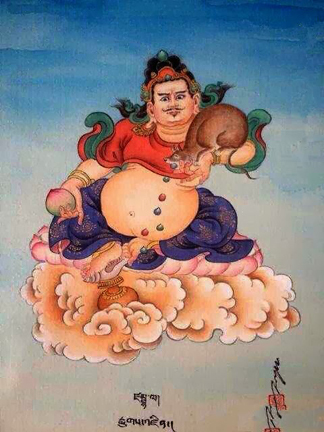 Red Jambhala is said to be the manifestation of Vajrasattva, the Buddha of Purification. Some say that he is the Hindu God of Wealth, Lord Ganesha, and has the head of an elephant. Others picture him as having two faces and four arms. His Tibetan name is Dzambhala Mapo. 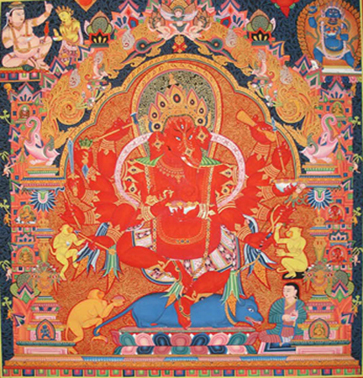 He offers protection, wealth and popularity when his mantra is chanted with sincerity. The last of the five Wealth Gods, the Green Jambhala, is thought to be a form of the Buddha Akshobhya (who reigns over the eastern paradise). He is usually shown in tight embrace with his consort. He is actually blue in color. The Green Jambhala made a sacred vow witnessed by Buddha Sakyamuni that he would protect anyone who chanted his Mantra. I connected the Yellow Jambhala image with what I realized were MY blessings of ‘wealth’, maybe not mega-bucks in my pockets, but certainly an abundance of creature comforts I often take for granted. I am rich in health, love and spirit (I hope), and if the inconvenience of yet another a Snow Day is my most challenging moment, well – I guess I shouldn’t be complaining at all! Yeah! The beauty of the snow, the playfulness of my boys around me … This day has turned itself around rather nicely. 4 PM … Ring, Ring, Ring … RING, RING, RING!!! … Uh, Hello? ?